The Space Review: How should NASA return to the Moon? How should NASA return to the Moon? It is the first big issue of the Bridenstine era at NASA, although many of the key decisions predated his arrival on the ninth floor of NASA Headquarters. If NASA is going to go back to the Moon, how should it get there? “This action is viewed with both incredulity and dismay by our community, especially as the President’s Space Policy Directive 1 directs NASA to go to the lunar surface,” scientists said of the Resource Prospector cancellation. When NASA released its fiscal year 2019 budget proposal in February, it included something called the “Exploration Campaign” that offered a consolidated vision of its lunar exploration plans. That campaign combined development of the Deep Space Gateway—now renamed, less eloquently, as the Lunar Orbital Platform-Gateway—with a series of robotic missions to the lunar surface. Those missions would start with hitching rides on commercial landers, while later developing larger landers that could be precursors for human-rated landers. That DNA chart, though, is missing one gene many assumed would be a part of it, and in fact predates the campaign: Resource Prospector (RP). That mission, under development for several years at a low level, was to feature a rover that would land near the lunar poles and venture into a permanently shadowed crater there. The rover would search for water ice deposits there and extract samples for testing. That mission, lunar scientists argued, could demonstrate how feasible it could be to use water ice for future expeditions, including human missions. As it turned out, Resource Prospector was being formally cancelled just as Bridenstine was being sworn in as NASA administrator. The current and former leaders of the Lunar Exploration Analysis Group (LEAG), a NASA-chartered organization of lunar scientists, wrote to Bridenstine about Resource Prospector April 26, saying they heard that the mission had been cancelled three days earlier and would be formally closed down by the end of May. “Our hope is to take one or two shots on goal every year” starting in 2019, said Zurbuchen. That announcement came the same day that NASA issued a draft request for proposals for its Commercial Lunar Payload Services (CLPS) effort to start flying payloads on commercial landers. Under CLPS, NASA would buy payload space on commercial lunar landers, starting with small missions: NASA’s minimum requirement is the ability to land ten kilograms of payload on the lunar surface. “We’ll leverage commercial capabilities for these small payload deliveries, and CLPS missions will play an important role in our expanding and sustainable lunar exploration strategy,” Bridenstine said in a May 3 statement about the program. NASA’s science directorate is on board with this initiative, seeing it as an opportunity to fly more missions to the lunar surface. “Our hope is to take one or two shots on goal every year” starting in 2019, said Thomas Zurbuchen, NASA’s associate administrator for science, at a meeting of the Space Studies Board of the National Academies May 2. 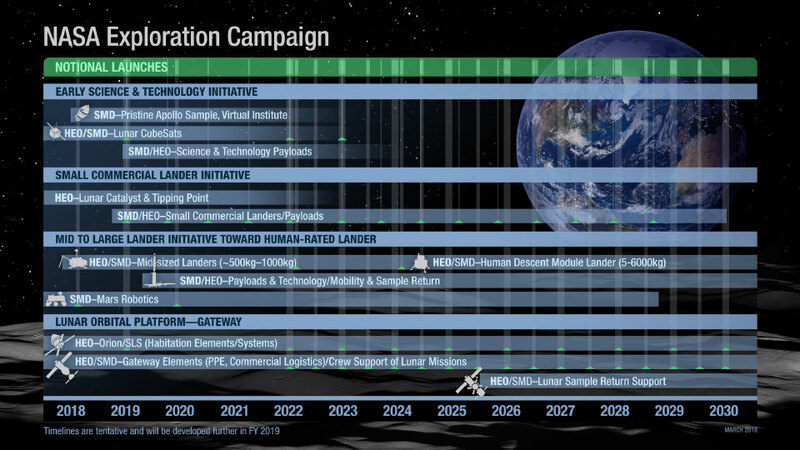 That is an ambitious schedule given the status of likely lunar lander missions. Moon Express has been working on lunar lander concepts for years but hasn’t given an updated date for the launch of its first mission since the end of the Google Lunar X PRIZE (GLXP), of which it was one of the finalists. Astrobotic, another former GLXP team, also continues to develop lunar landers, but has suggested its first launch might not be until 2020. Industry, as one might expect, backs the decision by NASA to focus on commercial landers versus Resource Prospector. “CLPS is a logical first step in building the foundations of NASA’s commercial lunar partnerships that will support great science while leading to larger robotic and human landing systems,” said Bob Richards, CEO of Moon Express. Some scientists have criticized the demise of Resource Prospector, noting that the rover was more capable than commercial landers being considered now, which lack the capability to carry anything more than relatively small rovers. Putting an RP instrument intended to analyze ice deposits in shadowed craters on a static lander that will operate outside one of these craters makes little sense, they argue. However, it was clear long before this announcement that Resource Prospector was not in great shape. NASA had spent about $100 million on RP and a precursor project called RESOLVE over several years, but progress had been limited: some tests of a mockup rover on simulated lunar terrain, for example. The rover also lacked a ride, as the project first tried to find partnerships with other countries, such as Japan, South Korea and Taiwan, to land the rover, then later considered commercial options. “Resource Prospector is the mission that keeps on promising and never delivers,” Neal said. NASA has already signaled its plans to cancel Resource Prospector in its fiscal year 2019 budget proposal. NASA “is no longer pursuing a potential independent Resource Prospecting [sic] (RP) mission, but integrating the RP measurement objectives with [Science Mission Directorate] Lunar Discovery Exploration Program and lander capability advancements under the Advanced Cislunar and Surface Capabilities programs,” stated the agency’s budget proposal, the same one that introduced the Exploration Campaign concept. That put the mission in limbo even before the formal cancellation announcement. “Right now it’s a little bit nebulous where it fits in,” said John Guidi, deputy director of NASA’s Advanced Exploration Systems division, during a NASA town hall meeting at the Lunar and Planetary Science Conference in March. He added he was “still hopeful” the mission could continue in some way. Guidi was responding to a question form Clive Neal, who expressed frustration at the lack of progress by, and lack of apparent support for, the mission. “Resource Prospector is the mission that keeps on promising and never delivers,” he said. Congress could intervene and direct NASA to continue developing Resource Prospector, although so far there’s been little sign key members will seek to do so, such as during a markup of a 2019 spending bill by a House appropriations committee later this week. For now, NASA is focusing on development of commercial lander capabilities, and Bridenstine appears to be fully on board with those efforts. He is scheduled to speak at an industry day Tuesday for the CLPS program at NASA Headquarters, one of his first public appearances since being sworn in two weeks ago. “We’ll draw on the interests and capabilities of US industry and international partners as American innovation leads astronauts back to the Moon and to destinations farther into the solar system, including Mars,” Bridenstine said in the May 3 statement about the agency’s lunar plans.